Ohio State vs. Purdue and Maryland vs. Penn State tonight. Purdue vs. Michigan State on Saturday. Several potential bubble-busters in between. Needless to say, it’s a big week in the Big Ten. Let’s take a look at a few quietly-important trends worth keeping an eye on. Purdue’s Struggling Defense. Just because because the Boilermakers own the nation’s longest winning streak of 18 games doesn’t mean all is rosy in West Lafayette. After holding 12 of its previous 14 opponents to less than one point per possession, Purdue has recently allowed five straight opponents to exceed that mark — including Rutgers, which scored 1.17 PPP in a near-upset of the Boilermakers on Saturday. In just a few weeks, Purdue has dropped from fifth nationally in defensive efficiency to 15th, a slump that’s coincided with four straight games decided by fewer than 10 points. Purdue won all four, of course, but when you consider that 10 of its previous 11 victories were absolute blowouts, you begin to understand why it’s worth pointing out. 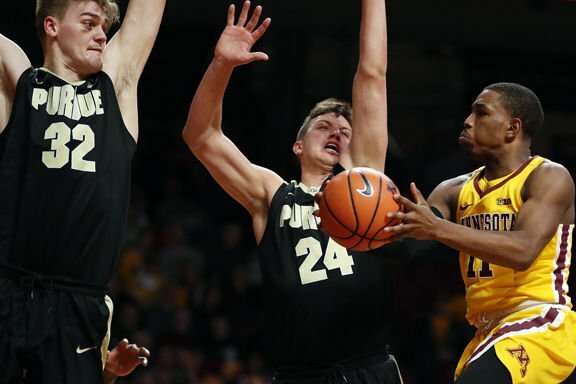 Matt Painter’s group has looked visibly less active in guarding the perimeter over that stretch, and part of the problem may also be rim protection: shot-blocking maven Matt Haarms has only swatted six shots since January 20, his lowest five-game stretch of output this season. It will be interesting to observe how the Boilers fare against Keita Bates-Diop in tonight’s big showdown with Ohio State. Michigan State’s Troubling Late-Game Execution. On January 22, Michigan State led Illinois by 18 points with 4:29 left, only to see the Illini cut the lead to eight in a matter of three minutes. Against Penn State last week, a 15-point lead with 1:09 to play shriveled to six — and nearly three — in just 30 seconds. 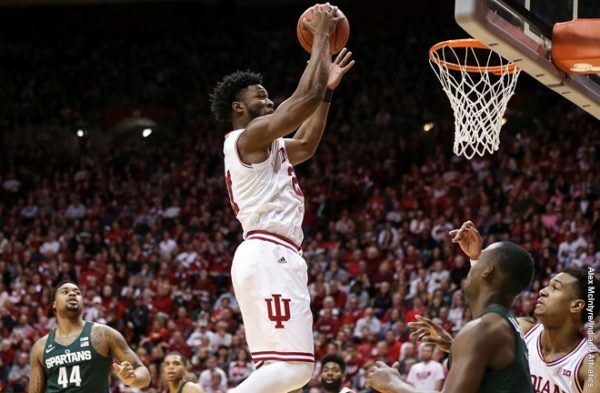 Up 10 at Indiana on Saturday night, Michigan State mustered just three field goals in the game’s final 12 minutes, giving the Hoosiers a chance to tie it at the buzzer. Part of Sparty’s problem has been shear boneheadedness, like Miles Bridges’ and-1 foul of Devonte Green in the closing seconds against Indiana. But these late-game struggles also shed light on a broader weakness: the Spartans are simply less productive and more turnover-prone in the half-court, where their offense has often lacked rhythm. It wasn’t an issue in Tuesday night’s scare at Iowa, but it could be against Purdue on Saturday. Illinois’ Home Trap. Believe it or not, the 12-12 (2-9 Big Ten) Illini have lost just three home games all season: a pair of overtime heart-breakers against Maryland and Iowa, and a competitive loss to Michigan State. Brad Underwood’s aggressive defense — which ranks third nationally in defensive turnover rate (24.4% TO) — seems extra aggressive inside the State Farm Center, where it forced the Terrapins, Spartans and Rutgers into 25 turnovers apiece. With bubble dwellers like Penn State (this Sunday) and Nebraska (February 18) coming to Champaign soon, don’t be surprised if the Illini spoil some NCAA Tournament aspirations. This team is downright scary defensively in front of the Orange Crush. Penn State’s Offensive Inhibition. When Penn State attacks the rim and moves the ball with purpose, its offense can be lethal. Case in point: Saturday’s dunkathon against Iowa. And there aren’t many better pick-and-roll duos than Tony Carr and Mike Watkins, both of whom should earn all-Big Ten honors at season’s end. Unfortunately, the Nittany Lions’ offense has shown a tendency to tighten up late in games against quality opponents. After scoring 1.3 points per possession over 30 minutes at Northwestern, Penn State failed to make a single field goal in the last 10:37 of the game, ultimately losing by nine. Were it not for Carr’s heroics at Ohio State, the headline for that game may well have been “Penn State crumbles late.” At Michigan State last week, Penn State — up 11 points with 15 minutes to play — went stagnant down the stretch and missed on a key upset. The extent to which Pat Chambers’ talented group remains aggressive against Maryland tonight could determine whether it remains on the bubble. Freddie McSwain, Offensive Rebounding Machine. Indiana shot a paltry 29 percent from the floor against Michigan State on Saturday and still nearly won the game. And do you know why (the Spartans’ inconsistencies notwithstanding)? The Hoosiers absolutely obliterated the Spartans on the glass. More specifically, 6’6″ forward Freddie McSwain — who has been a role player for much of the season — ripped down a ridiculous nine offensive rebounds (16 total) against one of the best rebounding teams in college basketball. The athletic senior then followed it up with five more offensive boards (nine total) in Indiana’s blowout road win at Rutgers on Monday. After months of inconsistency, McSwain has imbued the Hoosiers with a newfound interior toughness, which — combined with Juwan Morgan’s recent excellence (23.2 PPG since January 19) — should scare the daylights out of NCAA Tournament hopefuls like Nebraska (February 20) and Ohio State (February 23). This entry was posted on Wednesday, February 7th, 2018 at 11:33 am by Tommy Lemoine	and is filed under big ten, feature, microsites. Tagged: big ten, Freddie McSwain, illinois, indiana, Matt Haarms, matt painter, michigan state, Miles Bridges, ncaa tournament, penn state, purdue. You can follow any responses to this entry through the RSS 2.0 feed. You can leave a response, or trackback from your own site.